Kim and Jake were married on a chilly, but beautiful day! 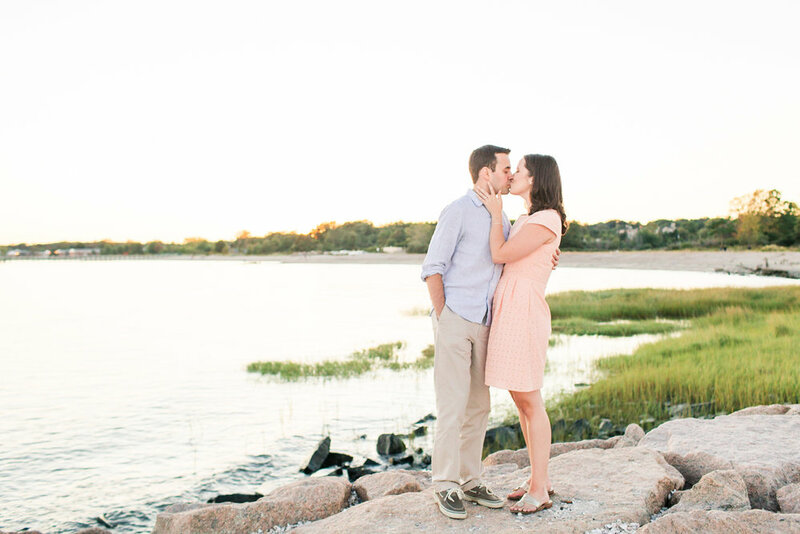 They celebrated their nuptials at the Branford House in Groton, Connecticut, which boasts beautiful water views of the sound. Jake is a member of the Coast Guard, so it only made sense that they wed at the chapel of the Coast Guard Academy in New London, Connecticut. After their ceremony concluded, the newlyweds headed down the stairs of the church through a sword arch, where they were told they wouldn't pass unless the groom gave his bride a kiss! Kim, Jake, and their wedding party were total champs for portraits on the back lawn of the Branford House. The winds were blowing but they were all smiles as their photos were being taken. For portraits of the bride and groom, we walked around the grounds with Jake and Kim who were definitely basking in those newlywed vibes! Their wedding color palette consisted of navy blues and creams, as well as gold and copper accents. The Branford House has a huge fireplace in the main room and entrance of the building, which was decorated with lush greens, delicate white flowers, and pillar candles. It was definitely one of my favorite parts of Kim and Jake’s wedding day decor! After being introduced as Mr. & Mrs. to guests at the start of their reception, the newlyweds shared a romantic first dance, followed by sweet dances with their parents. The night ended with Jake and Kim cutting their wedding cake and plenty of dancing! The natural light that flooded through the chapel windows was unreal! It was absolutely beautiful! Isn’t this a stunning venue?! The Branford House is perfect for a classic, timeless, Connecticut coastal wedding! I loved these lush greens that decorated the mantle of the giant fireplace! I hope you enjoyed this wedding at the Branford House! Do you know Kim and Jake? Show the newlyweds some love by commenting below!